Much like wine tasting, whisky tasting seems to have a colourful language all of its own. For example "A gentle and soft aroma to start, almost shy, but it heightened our expectations of what was to come. Making baked apples with brown sugar, cinnamon, chopped pecans, currants, raisins and sultanas as well as anise-flavoured cookies, a smell of pine needles and wood sap from a fresh cut fir tree – happy childhood memories of the night before Christmas. 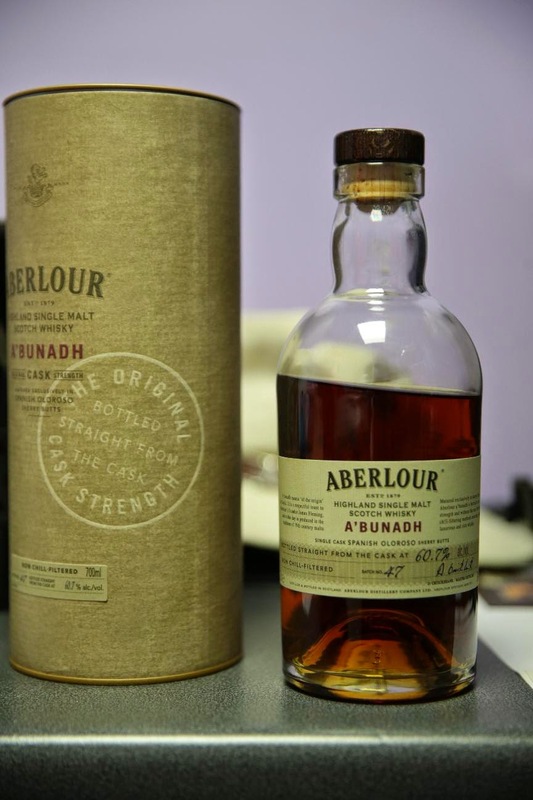 It is a waxy, oily, honey mouth coating texture with flavours of sandalwood, resin and exotic spices. With water there is a hint of wood smoke followed by candied orange and lemon peel, dried fruits and cardamom. Now on the taste a pleasant light woodiness combined with fragrant spices and fresh mint - this makes a great Advent dram." which is 35.101. I doubt I could ever be so colourful, but I thought I would try and give a report on this particular bottle. It was actually got for me by JJ for my birthday, but as our paths did not pass until this month I did not know. Many got me whisky for my birthday, hearing that I drink whisky now, and some got expensive bottles. Sadly whisky is not all the same, and I like some whisky. For reference the SMWS ones described as sweet and spicy are usually what I like, and definitely not anything peaty. When I saw this, I though "not another whisky", but the description was intriguing . Ages in sherry casks, but oddly no indication of the number of years aged. That is not mandatory but very rare for any whisky not to say the age. Even so, when I looked at the bottle itself the colour was not a good sign - that usually means it is peaty, but the description did not say so. It seems the sherry may have coloured it, which is fine. "Imagine gargling TCP antiseptic liquid, and perhaps drinking neat marmite from a squirty bottle. That would give you some idea of the impact of the initial sip. It only took a couple of sips to realise that I was not, in fact, over the tummy bug with which I had been suffering last week. Persevering the taste seems not to be an acquired one. If you allow some time for your taste buds to recover, you may detect a hint of liquorice and a cane sugar taste (not golden syrup, more like black treacle). A second glass is not recommended." And yes, my desk is level - that picture suggests this drink even defies gravity. You have read Iain Banks's whisky book (_Raw Spirit_) I hope. Ah, no - will look. You neglect to mention that's a Cask Strength bottle, I can see in the picture. That exagerates the taste as well as the alcohol.